If you want to truly connect with your target market, any marketer will tell you, about the importance of defining your target market profile. This means establishing exactly who you’re directing your products and services at. These are the people who desperately want and need what you’ve got! After you’ve covered the traditional customer demographics, delved into the psychographics, and even dabbled in the technographics, is there a deeper level to analyse your ideal customers so you can connect with them better than your competitors? Maybe there is. Let’s have a look at Sociographics. 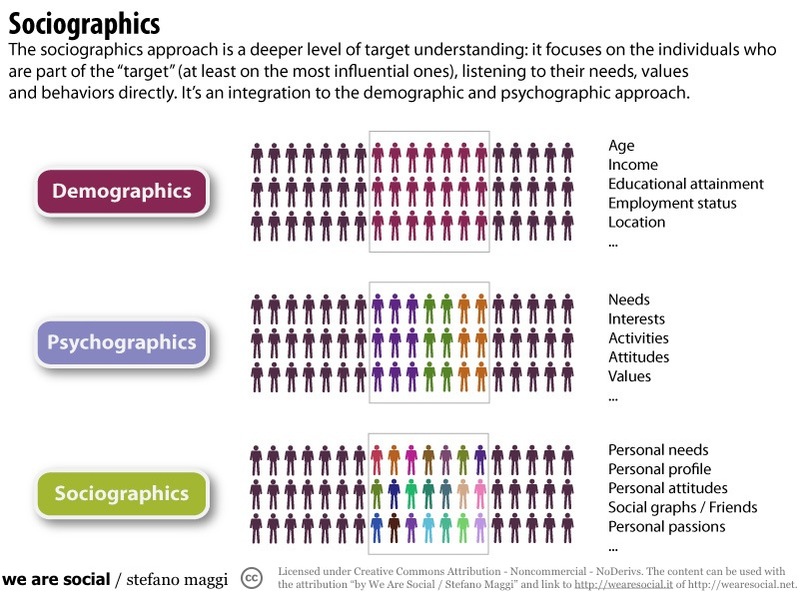 Sociographics take the target market down to the level of the individual, where they determine the specific values, attitudes, friends, hobbies, passions, and influences. Essentially, they allow you to discover what really pushes your customers buttons. Sociographics are the characteristics that influence the way people receive and perceive messages. This can also be directly related to the groups they belong to, that in turn define how your market behaves socially. This may then determine how your market engages with your business, products, services and brand. So how can you use this information to attract and connect with more ideal customers? The best way to understand your customers better when conducting target market research is to jump on the net – of course! Social media networks provide an amazing platform from where you can learn about your customers, and then also connect with them. On and off the social networks, the groups your target market associates in and with, can say a lot about what they really believe. What are your thoughts on sociographics? Are they pivotal in developing true understanding of a target market? Or does research need to extend into such depth? Feel free to comment below. I welcome your thoughts and feedback. The information I got about sociographics in this post is very significant for my study in business marketing. Thank you very much that you have kindly shared this information through this blog. This is one of my favourite sections in defining a target market. It really helps extend on the demographics. Great post. With an understanding of social demographics, having success both online and offline are possible. Those that have neglected this world would learn a lot from this post. Thanks for. Your assistance in extending appreciation of the added value of sociographics.